Camel pose yoga is also known as Ustrasana (उष्ट्रासन). In the camel pose, the thighs, trunk and head resemble the neck of a camel therefore; the name has been suggested as camel pose. It is associated with so many health benefits as the asana gives a wonderful stretch to the thighs, abdomen, thoracic region, ribcage and throat thereby beneficial in smooth functioning of lungs, hearts and other important parts of the body. Though, there are so many important benefits of camel pose. But here five important benefits are being enumerated, which is himself experienced by the write who is practicing yoga since the last 10 years. I have also given therapy to large number of yoga practitioners and found the efficacy of this yoga. Camel pose for flat stomach: There is a large scale of queries one can get on internet regarding how to get flat stomach fast. No doubt, some of these exercises and diet plans are good to reduce belly fat. However, one of the best ways to get flat stomach is practicing camel pose step by step. If one practices this yoga technically and regularly, considering awareness, breathing and maintaining the same for a certain period of time, belly fat burning can be observed even within week. Thus regular practicing this asana for a certain period of time also ensure in weight loss. This not only reduces abdominal fats yet plays an important role for the proper functioning of abdominal organs. Lungs diseases prevention: A large number of people are suffering with respiratory related disorders and diseases, especially in town and cities due to high levels of pollution. These diseases sometimes happen due to improper expansion and contraction of lungs. Practicing of camel pose helps to expand your chest and thoracic region and ward off nasal congestion, sneezing, blocking of respiratory passage, bronchitis, and manage other ailments related with lungs. Ushtrasana also expands the ribcage and make the associated muscles more supple and flexible thus facilitated deeper breathing. Thyroid prevention and management: These days thyroid problems like hyperthyroidism and hypothyroidism has become a common phenomena. The practicing of this pose under the supervision of a yoga therapist not yoga instructor will surely help to manage thyroid. In fact, the asana facilitated smooth massage to the thyroid gland thereby help to ensure proper releasing of thyroxin hormone, which is good for thyroid problem. However, to get maximum advantage of this asana for thyroid, one has to perform it peacefully and concentrating the mind on the appropriate stretching of the thyroid region. Healthy spine: This is one of the best yoga poses for spine stretching and spine health. The practicing of camel pose or half camel pose gives suitable stretching to the spine, accordingly ensures vertebral loosening. While performing this asana, the shoulders are pulled backwards and the chest is pushed forwards, that helps to correct rounded shoulders and stooping back. 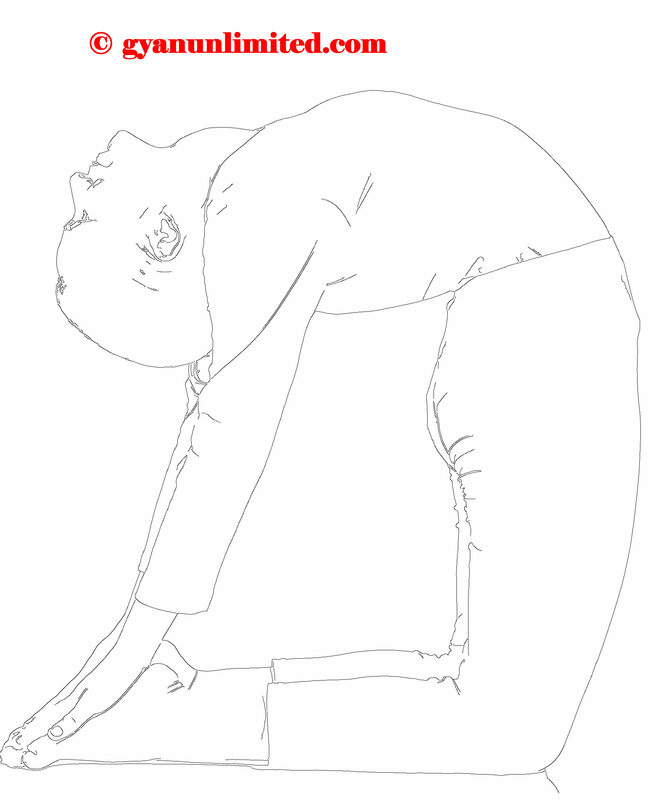 Those who are suffering from backache and neck ache should perform this asana. However, in case of backache and neck ache, one should practice it before a yoga therapist so that suitable measures may be taken care of. Diabetes management: Due to wonderful stretch to the whole chest and abdomen, at the same time imparting a thorough massage to the internal organs. As a result, it is useful for alleviating various abdominal ailments associated with the kidneys, pancreas, intestines, liver, etc.. Due to appropriate massage to pancreas, it helps to provide insulin hormone thus good in the management of diabetes. Since, it provides suitable stretching to the organs related with digestive system thus good for digestion also. Great analytical write up. very few website put the things like this. I ADMIRE YOUR EXCELLENT WEBSITE WITH BEST OF YOGA AND PRANAYAM KNOWLEDGE! I ADMIRE THAT YOUR GOOD ADVICES ON ASTHMA AND HIGH BP NATURAL CURES!